Suffering with abdominal upset, such as gas, cramps, bloating, constipation or diarrhea, could mean you are not tolerating that glass of milk you had at breakfast or that slice of cheese you had for lunch. Being lactose intolerant means you can't digest the lactose or natural sugars found in most dairy products. According to the American Society on Aging, millions of Americans suffer from lactose intolerance. Lactaid, a product of McNeil Nutritionals, LLC, still allow you to get the recommended daily dairy allowance, without the pain. One serving of Lactaid milk is 1 cup or 240 mL with eight servings per container. Varieties include Reduced Fat 2 percent, Lowfat 1 percent, Fat Free, Whole and Chocolate Lowfat 1 percent. Lactaid Calcium Enriched Milk includes Reduced Fat 2 percent, Lowfat 1 percent, Fat Free and Whole Milk. Lactaid milk also comes in Organic in Reduced Fat 2 percent and Fat Free. One cup of Lactaid whole milk has 160 calories, 8 g fat -- 5 g saturated fat, 35 mg cholesterol, 125 mg sodium and 350 mg potassium. Reduced Fat 2 percent has 130 calories, 5 g fat -- 3 g saturated fat, 20 mg cholesterol, 125 mg sodium and 370 mg potassium. Fat Free Lactaid has 90 calories, no fat, less than 5 mg cholesterol, 125 mg sodium and 380 mg potassium. Lactaid is real milk, 100 percent lactose free and it tastes just like real milk. A single serving of Lactaid whole milk has 12 g total carbohydrates, no dietary fiber, 12 g sugars and 8 g protein. Reduced Fat 2 percent and Fat Free Lactaid have 13 g total carbohydrates, no dietary fiber, 12 g sugars and 8 g protein. Lactaid can be used on cereal as well as a milk substitute in recipes calling for milk. 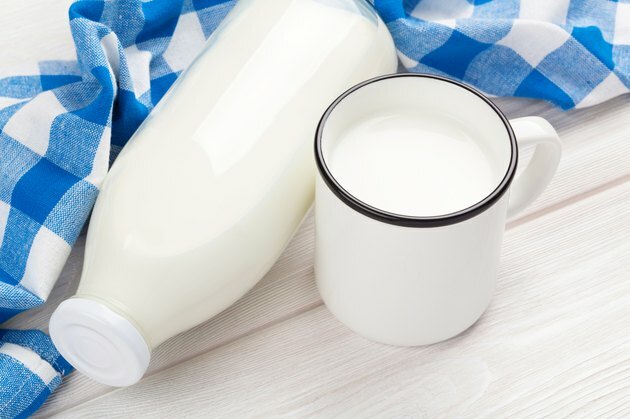 Lactaid Whole Milk, Reduced Fat and Fat Free provide 6 percent to 10 percent of the daily value of vitamin A, 25 percent vitamin D and 30 percent calcium. Lactaid Calcium Enriched Whole Milk provides 6 percent of the daily value of vitamin A, 15 percent vitamin B12, 25 percent riboflavin and vitamin D, 35 percent phosphorus and 50 percent calcium. Lactaid Whole Milk contains milk, lactase enzyme-an ingredient not found in regular milk and vitamin D3. Lactaid Reduced Fat 2 percent and Fat Free Lactaid contain reduced or fat free milk, lactase enzyme, vitamin A palmitate and vitamin D3. Lactaid Calcium Enriched Whole Milk contains milk, tribasic calcium phosphate-calcium, carrageenan, guar gum, lactase enzyme and vitamin D3. This milk also contains 500 mg calcium per serving, while regular milk contains 300 mg calcium per serving. What Are the Benefits of Milk Powder?